Chalk it up to house tradition: Murals line the brick walls of Burton-Judson, inspired by sources from Degas to Sherlock Holmes. Students find ways to make their dorm rooms into homes, but some also bring that creativity into the common areas. The brick walls of Burton-Judson Courts are lined with chalk murals inspired by Degas, Warhol, and Sherlock Holmes. The art is an adaptation of the University house tradition to decorate the dorms before the first-years arrive. Most of the other dorms are lined with cut-out paper decorations related to the house theme. 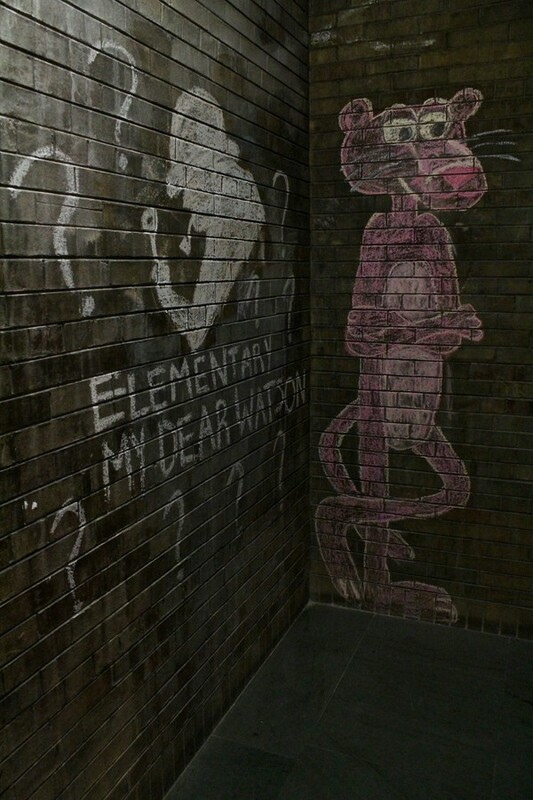 The detailed chalk art in B-J is unique. In the days leading up to orientation, the house brings to life a theme that they plan over the summer. The execution of the artwork is largely a community effort, with house Resident Heads, Assistant Resident Heads (RAs), Orientation Aides (O-Aides), ex-pats, and even members of other houses lending a hand. Although there is no formal time to continue the work during the year, students find chalk and add their own marks; the art evolves along with the house. B-J’s Salisbury House uses the art to add energy to its otherwise dark stairwells. This year, Salisbury residents chose to decorate their house with pictures of the other dorms. Sebastian Fernandez-Mulligan, a second-year Salisbury O-Aide, considers the chalk art a way to welcome the first-year students as they enter their new living space. Salisbury House: Max Palevsky Residential Commons as depicted by Sebastian Fernandez-Mulligan. B-J’s Chamberlin House took a more clandestine approach to its wall decorations. With a theme entitled “Chamberlin of Secrets,” you would think it chose to decorate with Harry Potter symbols. But the house instead decided to display different forms of secrecy. Chamberlin residents created images relating to secret identities, conspiracy theories, and spies. 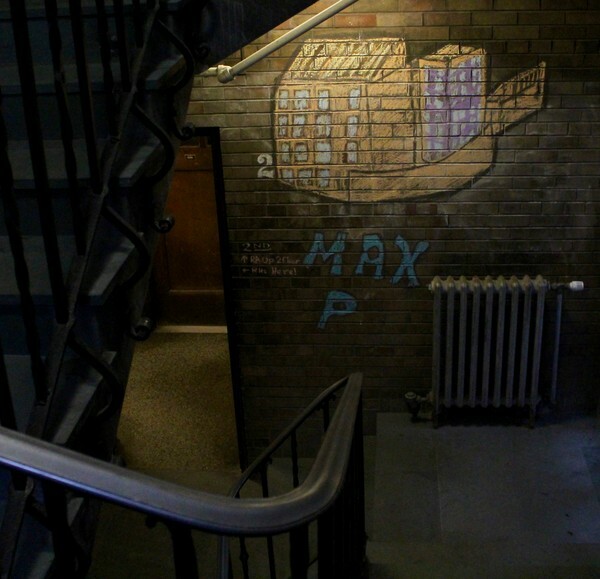 Chamberlin House: O-Aides and other house leaders chalked the walls with an homage to spy films. Another house transformed its living space into a time-warp through art history. In keeping with the tradition of making the theme a pun on the house name, Linn-Mathews has titled this year’s theme “Linn-pressionism and Abstract Art,” with the Linn side of the house representing Impressionism and the Mathews side portraying abstract art. This title fits the house’s wid array of pieces ranging from a representation of Van Gogh’s “Bouquet of Sunflowers,” an Impressionist painting from 1881, recreated by Amber Estes and Rachel Hildebrand, to a depiction of Andy Warhol’s iconic series of Marilyn Monroe prints, done by Hildebrand with neon chalk. The pieces are arranged chronologically starting on the ground floor, creating a visual representation of the progression of art as one climbs the stairs. The pieces are accompanied by phrases like “This is not a wall” and “The Goose is Loose,” a nod to iconic painters. The grand finale on the highest floor is a large and colorful depiction of a ballerina made by Dee Nitz, a fourth-year O-Aide. 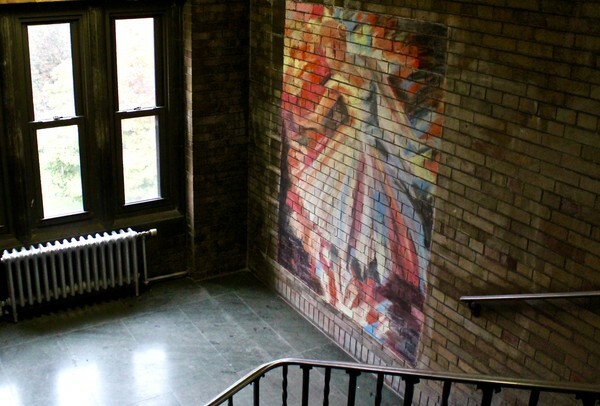 Linn-Mathews House: Inspired by Impressionism, Dee Nitz's ballerina is stairwell's pièce de résistance. The works provide comfort for students as they go through college. “There’s some sort of familiarity you live on your floor and you see the same pieces every day,” Nitz said. Although the space seems like a gallery, it is not meant evoke a museum necessarily. It is “dirtier than a museum…. It’s a place for things to happen,” Nitz explained. The hard work and outstanding results of the project sadly cannot last due to the evanescent nature of chalk artwork. Amber Estes, RA of Linn-Mathews, explained that the pieces turned out better than expected and she would be saddened to take them down. She said there is a possibility that they will keep the art up and add-on until the walls are all covered. 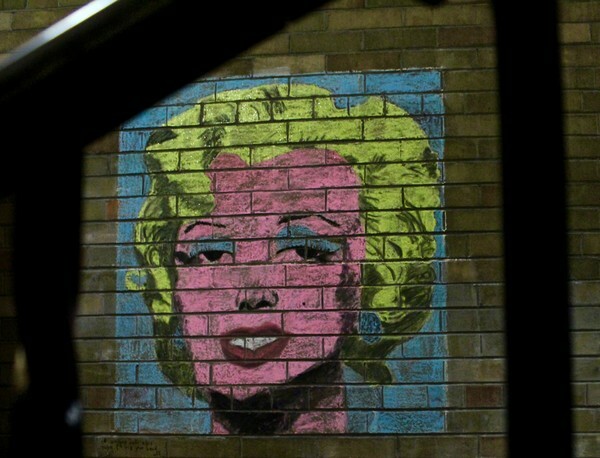 Linn-Mathews House: Marilyn Monroe by Andy Warhol by Rachel Hildebrand.